Take rice into a bowl, add water and wash it. Discard the water and add 200gms of fresh water to the rice. Place the rice bowl in pressure cooker and cook. After first whistle lower the flame and cook the rice for 10 minutes. Remove the rice bowl from the cooker as soon as the cooker cools down. Spread the cooked rice in a plate and add 1/2tsp ghee. Mix the rice with a fork to coat with ghee. Mixing with a fork will not make the rice mushy.Crush garlic clove (1 or 2), cinnamon stick & cloves in a mortar and pestle. Take this spice crush into a plate and cover it till use. Take a microwave safe bowl and add potato cubes, carrot cubes, green peas and sliced french beans. Add 30ml water to the vegetables and place this bowl in oven. Cover the bowl partially and cook on high power for 5 minutes. Mix well with a spoon and add 25ml water (or as required) and place this bowl in oven covering it partially. Cook on high power for 3 minutes. Allow 2 minutes standing time before removing the bowl from oven. Fry cashew nuts till golden in color. Similarly fry the raisins till they swell. Keep these fried ingredients aside for garnishing. Heat a pan and add oil to it. When oil is hot add caraway seeds and fry till they splutter. Then add sliced onions and fry till they are crisp. Then add the spice crush, turmeric powder, red chili powder and cooked vegetables. Mix all well and add salt. Mix again and cook covered on low flame for 1 minute. Then add the cooked rice and mix to coat the spices well. Cover the pan and cook for 1 minute. The dish is ready to serve. Garnish with fried cashew nuts and fried raisins. Cut the vegetables evenly—so that they cook well and also look good. Garlic smell lovers may add 2 or more garlic cloves. Red chili powder gives color as well as taste to the dish. However green chilies may be replaced for red chili powder. 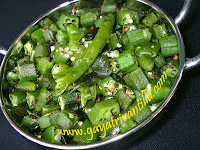 But remember to fry the green chilies well in oil to bring down the hotness. Remove the rice from cooker as soon as it cools down. Immediately spread the rice in a plate and add ghee. The rice grains will not stick when ghee is added. Mix the rice with a fork. Mixing with a fork will not make the rice mushy. Cover the spice crush till use to retain the aroma. In pulaos we generally put whole spices, while in Biriyanis we put powdered (ground to paste) ones. This dish tastes like that of a Biriyani family but looks like a Pulao. Serve this dish hot with any paneer gravy dish or cucumber raita. This is the first North-Indian dish I have tasted. In our family we were not used to eating garlic. So when we prepared a Biriyani recipe with all the masalas—it was too pungent for us. So my father suggested major changes and my mother prepared this milder version of Biriyani. My father wanted us to enjoy this north-indian taste also. Though we have cut down so many spices yet it gave a unique taste to this rice dish. As expected we enjoyed this dish very much. From then on this used to be a regular dish in our house and we enjoy it with onion raita. So I gave a name to this recipe as NANNA (FATHER IN TELUGU) BIRIYANI. Even after my marriage I regularly make this NANNA BIRIYANI and my family members enjoy it. My father passed away in October 2008 and I dedicate this recipe as a tribute to him. Recently I prepared vegetable rice and it came out very well. Thanks for sharing the video. I must say, this web site has a very good collection of videos and especially your narration, which is very much detailed. Once again thank you so much for posting the videos. How r you? I tried your Mixed Vegetable Rice recipe. Thankyou so much for sharing this recipe. It will be very useful to prepare in get togethers especially when aged persons attend. It tasted very tasty with very less ingredients. Your tips for preserving Curry,Coriander and Mint leaves worked out very well. I tried so many tips but nothing worked out. Especially mint leaves preserving in fridge is a big headache to me. I stored mint leaves as per your tip. Mint leaves remained fresh for 10days. I am very gratefull to you for sharing these tips. I made lemon pickle with your measurements. It tasted very well. Measurements are perfect. Gayatri garu can you please post Tomato Pachadi which normally our elders make by drying tomato pieces in sunlight Or atleast tomato pachadi which we can store for Minimum 2 months. I was so happy when I found this site few months ago. 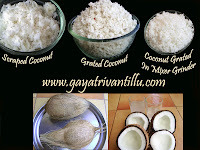 This is the first site to provide the traditional andhra recipes. I love cooking and I found many of the recipes useful in everyday cooking. Thanks for your effort. Could you please provide some savoury snack recipes like chegodeelu and different types of janthikalu, murukulu etc. I found few like karappusa etc. mee website chala chla bawundhi. vanta raani wallu kuda chala easy ga nerchukowacchu. nenu ee site chala mandi ki recommend kuda chesanu.